The Winner High School boys track took fourth place at the state track meet this weekend and senior Cameron Kuil was named the MVP of the meet. Kuil won the 400, 200 and took second in the 100. He also ran on a relay. Kuil was the gold medal winner in the 400, which means he had the top time in all three classes. Kuil won the 400 in :48.52 which was close to a state record. He won the 200 in :22.26 and was second in the 100 in :11.08. 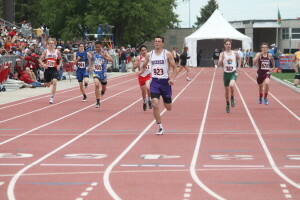 Kuil said at the state meet he just did what he usually does. “I knew if I just did me, it would work out and it turned out pretty good.” When asked what was his best race, Kuil said the 400. Winner track coach Larry Aaker said he is so proud of the team. “Friday was a good day. Jayden Schroeder placing in the shot put was big for us and the boys 4×100 relay making finals was also a boost,” said Aaker. The coach added he is super proud of Cameron. He noted that everyone ran well from top to bottom. Aaker explained there were some athletes who just missed placing like Brady Fritz in the triple jump and Schroeder in the discus. The Warriors took third in the 4×200 in 21:3l.21 setting another school record and eighth in the 4×100 in :45.16. In the 800, Kayleb Brozik took fifth in 2:03.04. In the shot put, Schroeder had throw of 48-03.25. On the girls side, Sidda Schuyler took sixth in the 2 mile run in a time of 11:48.14. In the mile run on Saturday, Sidda Schuyler was 13th in 5:28.64. Samantha Schuyler was 8th in the 400 in 1:01.90. On Friday in Tea, the Lady Warriors ran the preliminaries of several relays.